"You've really changed the quality of my life." I recently saw the end of a relationship that I had been involved in for sixteen months, so I will be the first to admit that my outlook on love is perhaps a bit skewed at present. But even with all of my recent personal struggles with that certain four letter word, I can still sense that the characters in Sweet Hearts Dance honestly seem to know nothing about love, or perhaps any sort of emotion. Instead of real life situations, the script places them in experiences that are designed to play for the maximum amount of tenderness and sentimentality. In a small, picturesque New England town, two couples are experiencing changes in their lives, but at opposite points. Wiley (Johnson) has been happily married for years to the beautiful Sandra (Sarandon), but he is starting to feel smothered by the confines of marriage. So, without warning he erupts at a Thanksgiving dinner and walks out on Sandra as well as their three children. Taking up residence near the local high school, he is visited frequently by Sam (Daniels) the local school board president who is in the midst of falling in love for the first time with Adie (Perkins). As Sam and Adie begin their relationship, Wiley and Sandra must struggle to keep together a happy family, all the while solving their problems. Though the general plot of Sweet Hearts Dance is simplistic in its construction, the same could also be said for the script by On Golden Pond writer Ernest Thompson. Thompson, who seems to be more content creating cute situations for his characters rather than giving them something meaningful to say, struggles in his attempts to create a flowing, involving story. Wiley is obviously frustrated in his life, but we never really find out enough that will allow us care whether or not Sandra takes him back. And an early fight that erupts between Adie and Sam never goes beyond a mild confrontation, though it is alluded to later as something more. If the script had been better focused on the downsides of love then perhaps the movie may have felt more complete; instead, it feels empty. While the groundwork laid for Sweet Hearts Dance is neither strikingly original nor wildly unpredictable, there is enough charisma in the cast to more than make up for the lack of intelligence and heart in the script. I enjoyed the rapport between each of the four main characters, particularly Daniels and Johnson; their conversations have an easiness about them and makes their frequent scenes together something to look forward to. All of this is made possible by the terrific performance given by Johnson in a role that saw him cast against type, and proved his ability to handle drama rather than his more action-oriented work seen most notably on Miami Vice. His performance here as a man struggling with putting his life together is something to behold, and is proof that given the right work, Johnson is a fine actor. Daniels is also very good is his role as he is yet again playing the every man he has done so well in films like Pleasantville. Sarandon and Perkins each do fine work, but their scenes are kept to a minimum, as the script seems to call on them only to further the efforts of their male suitors. Image Transfer Review: Presented in a cropped full frame transfer, Sweet Hearts Dance represents one of the first titles to be released by Columbia TriStar in a non-OAR format. Aside from this problem, the transfer generally looks good. The image suffers from a soft look and some of the early scenes show some grain, but the transfer maintains a high level of quality throughout. Colors are muted, but black levels and shadow detail are fine. Audio Transfer Review: Much like the video, the audio transfer is a sort of nonevent. A Dolby Surround track is largely center channel heavy while the left and right speakers are used only to reproduce the score. Dialogue is fine, though at some points in the film it seems as if it may have been mixed a bit to low. Extras Review: Theatrical trailers for My Best Friend's Wedding, About Last Night..., and Stepmom are each presented in nonanamorphic widescreen (with the exception of About Last Night...) with Dolby Surround. 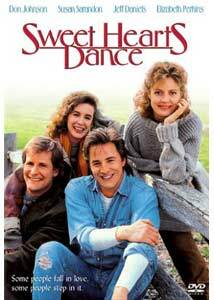 Had Sweet Hearts Dance had more real life experiences for the characters I could easily recommend the film as a rental, but it is the lack of believability that keeps me from doing so. I liked the performances, but I quickly grew tired of the movie-of-the-week like situations found in the film.